The 3 night Southern Reef itinerary takes guests from the mangrove channel at Hinchinbrook Island to the ancient rainforest of Dunk Island, and the untouched remoteness of Sudbury Cay. 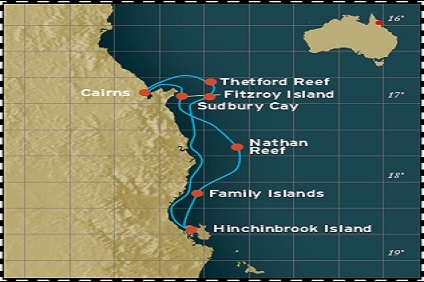 You will experience the beautiful environment of the Great Barrier Reef region, both on land and at sea. This immersive itinerary has been designed to provide ample time to explore the Reef through snorkelling, Scuba diving and glass bottom boat tours. Enjoy sunset drinks on private Sudbury Cay, and sumptuous seafood buffet. Cruise through the Hinchinbrook Channel by Glass Bottom Boat and wander along the Haven track, surrounded by mangroves. Spend time exploring the underwater world’s of Coates and Nathan Reefs, and visit the Turtle Rehabilitation Centre on Fitzroy Island – you may even be able to swim with a Sea Turtle just off the beach! Enjoy presentations by our Marine Biologist, including interactive “touch and feel” presentations, where you can see the Reef’s endemic species and learn about the area’s unique eco-system and marine biodiversity. Departs Cairns: Every Friday at 11:00am. Board at the Cairns Cruise Liner Terminal at 10:00am, and cruise Trinity Bay. Visit Sudbury Reef, and enjoy snorkelling, glass bottom boat tours, and optional Scuba diving. Finish the day with sunset drinks ashore on the deserted sandy cay. Cruise the majestic Hinchinbrook Channel whilst enjoying a top deck breakfast in the sunshine. Look for wildlife during a mangrove tour. Stretch your legs on Dunk Island, with a hike up Mt Kootaloo or a beach walk. With the aid of your guides, you may spot the electric blue Ulysses butterfly. Discover Nathan Reef on a guided snorkel: this reef is teeming with abundant fish life, including clownfish and Maori Wrasse. Later, visit colourful Coates Reef – see plate corals and parrotfish during an optional SCUBA dive, or stay dry and view marine life from the comfort of the Glass Bottom Boat, with expert interpretation by your on-board marine biologist. Enjoy a rainforest walk or a hike to the lighthouse. Snorkel over fringing reef and swim with Green Sea Turtles, before learning all about them during a visit to the Cairns Turtle Rehabilitation Centre. Return to Cairns to disembark at 1:30pm.